Today weddings are taking on many forms with many brides and grooms thinking outside the box and opting to for more unique and customized weddings that truly reflect them. Jennifer and Richard had rented out a camp ground for the weekend and asked their guests to join them for a camping wedding! Guests enjoyed campfires, crafts, and games. Groomsmen and bridesmaids were “camp counselors” and wore customized T-shirts. The groom wore a relaxed linen suit and sandals. The bride wore a handmade crochet dress. 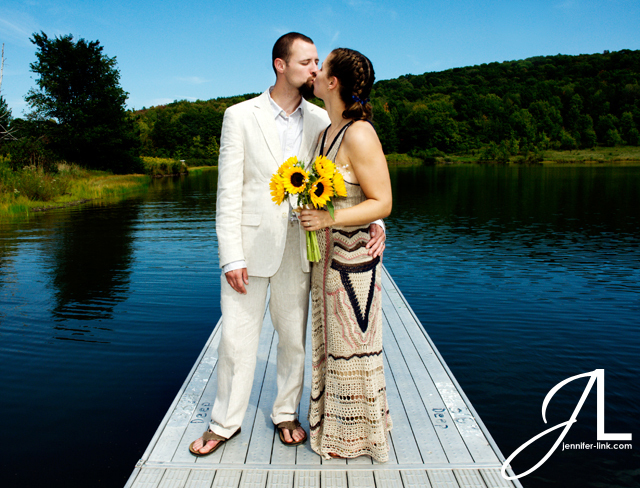 I shot their wedding photos around the lake in the center of the camp; it provided a beautiful setting.